The first time I went to The Nostalgic Cinema in 1989, that one guy (who was there every time I went there) in some loud, loud sports jacket thanked the projectionist / owner for programming a certain film the night before. This was the movie. Finally, after years of tracking it down, I see why. This movie is of special interest to me as I am fascinated with movies about moviemaking, especially the peculiarly unglamourous ones that Hollywood makes about itself. This effort is irresistible. Not only is it an amusing look at how Tinseltown chews up and spits out its great talents, but it is also a glorious representation of the Hollywood schmaltz that it also satirizes. It is also a high achievement so early in the career of director George Cukor, who would be renowned for several decades in helming pictures with strong female roles. In a superb opening sequence, Constance Bennett is a waitress in the famed Brown Derby (what a great set! ), who dreams of becoming a star. For now, she is basically serving coffee to the drunken movie execs. Then, a big Hollywood director (soused at the time, naturally) gives her a small role in his latest picture. Her tiny scene is however woeful, and she is to be replaced by another star, until the completely implausible "Give me another chance" scene, in which she does a retake, and suddenly the Hollywood brass think they have a new major star on their hands! This slightly comic fare, with superb dialogue and great dreamlike sets is at first a witty satire on Hollywood (with a neat look at the filmmaking process), then it suddenly turns tragic, as scandal ensues, and the once-great director who got her started hits the skids. 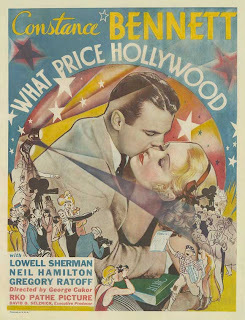 Joan Bennett is cute and spunky in the lead role, but Lowell Sherman positively steals the film as the drunken big shot director. With his sardonic wit, slightly lofty demeanour, his combination of humor and pathos is astounding. His is one of the best performances of its decade-- no kidding. Pretty much any "Hollywood biopic" cliché you can think of is in full view here-- in fact, this fictitious film probably invented them! (All it's missing is the bottle-thrown-into-a-mirror sequence) But What Price Hollywood is a wicked satire on how easily attained (or lost) stardom is, and the prices paid for it are indeed dear. And if the ending suddenly becomes too schmaltzy and optimistic for its own good, remember that this is what the formula demanded, and at the same time this is also a satire about those very pictures.